Dutch painter, designer, architect and engineer. 1541-1546, pupil of Reyer Gerrietsen in Amsterdam and from 1546-48 pupil of Ernest Maeler in Kampen. 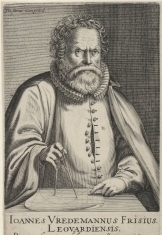 1549-1550, back in Friesland, studies in Kollum the work of Serlio and Vitruvius, both in Dutch translations published by Pieter Coecke van Aelst. Stayed with the painter Claude I Dorici in Mechelen. Marriage to Johanna van Muysen, possibly in Mechelen. 1555-1560, probably in Antwerp, start of collaboration with prints publisher. 1566, second marriage to Sara van der Elsmaer, daughter of the sculptor Wouter van der Elsmaer. In 1575-1586 in Antwerp, appointed as surveyor of the fortifications of the City of Antwerp. Between 1586-1589, via Frankfurt to Braunschweig to work as an architect for Duke Julius at Wolfenbüttel, visits Hamburg and Bremen. Between 1591-1596 he was working in Hamburg and also in Danzig. In 1598 in Prague, at the court of Rudolf II, preceded in 1597 by his son Paul. In 1600 he returned via Hamburg to Amsterdam. In 1601 he settled in The Hague and in 1606 he returned to Hamburg and died possibly in this year.